At the beginning of the 19th century, the Englishman James Sowerby (1757 – 1822) — already distinguished as an author of books on botany and natural history — introduced his colour system, which he dedicated to «the great Isaac Newton». It had the lengthy title «A New Elucidation of Colours, Original Prismatic and Material: Showing Their Concordance in the Three Primitives, Yellow, Red and Blue: and the Means of Producing, Measuring and Mixing Them: with some Observations on the Accuracy of Sir Isaac Newton». Sowerby sets himself two tasks with this work, which appeared in London in 1809: he wishes to re-emphasise the significance of brightness and darkness, which after Newton had fallen into obscurity; and he wishes to clarify the difference which exists between colours. Johann Heinrich Lambert has already emphasised that the colours of light and the colours of materials behave in a different way when mixed. In his system, Sowerby assumes the existence of three basic colours, red, yellow and blue (he actually selects gamboge — a poisonous yellow sap from Asiatic plants — carmine and Prussian blue, which are then combined). The sketches emphasise the three parts on which Sowerby’s theory rests and express the stabilising continuity which can exist between them. Incidentally, Sowerby’s attempt to transform Newton’s seven primary colours into three materially renderable basic colours attracted the attention of the English painter William Turner (the two were, in fact, acquainted). Later, in about 1820, Turner followed the painter Otto Runge in trying to assimilate the system of the three colours red, yellow and blue into a diurnal pattern (for which there is more than just one possibility, as was soon apparent). Sowerby’s text describes the optical mixtures which result when narrow and tightly packed strips of primary colour are applied to paper. It was to be another few decades, however, before the difference between colours was correctly understood, enabling a more precise distinction between colour mixtures. Coloured light is mixed additively, to use the modern term. That is to say, the sum of light rays with varying sprectral content (emanating, for example, from two lamps) will result in a new colour. Unlike the ear, the eye and the brain do not analyse the incident wavelengths; they create a new impression — in other words, a new colour. The additive mixture of red and green will, for example, result in yellow. Violet-blue together with green will give cyan. Two colours which additively neutralise each other and combine to form white are called complementary colours. The appropriate experiments will show that there are three such pairs: green and magenta; violet-blue and yellow; and red and cyan — to use their most exact possible descriptions. Coloured pigments have an effect that is very different to coloured light. Whereas yellow light comprises light of a definite wavelength, the colour of a yellow pigment is formed by the absorption of yellow’s complementary colour: namely, violet-blue. The subtractive mixture of a yellow and a violet-blue pigment will not result in white, but black. This also applies for both remaining complementary colour pairs: red and cyan but green and magenta will result in a pigment which does not reflect light and is therefore black. Here, we can point to a few distinctions which have traditionally always been blurred. To ignore them will always lead to confusion. Additively, the mixing of complementary colours will result in white; substractively, their mixture will result in black. Subtraction commences with all colours (white) and ends without light (black); addition begins without light (black), ending when all wavelengths are present (white). If — as is frequently the case — red, green and blue are regarded as the three additive primary colours because they deliver the largest palette of mixed colours, then for the same reason the subtractive primary colours should be pigments which absorb red, green and blue. In other words, the corresponding subtractive colours will be cyan magenta and yellow. Of Sowerby’s three basic colours — red, yellow and blue — we have exchanged yellow for green. Sowerby’s system originated at the same time as the English doctor and physicist Thomas Young (1773-1829) submitted his theory (later to be confirmed) stating that the eye generates all colours by combining only three wavelengths. This «Theory of Trichromatic Vision» is based on the primary additive colours red, green and blue. Young first arrived at his ideas for a trichromatic theory in 1801, when he explained that the eye cannot record each of the almost infinite number of colours separately; most probably, it records them rather more sparingly: «Since it is hardly possible to believe that each light sensitive point on the retina contains an infinite number of particles, which must all be in a position to oscillate with the respective wave in full agreement, it is therefore necessary to assume that this number is, for example, limited to the three main colours red, yellow and blue». This is not a typographical error. Young had first introduced the trio of colours with which the trichromatic theory is now linked in his «Lectures on Natural Philosophy and Mechanical Arts», dating from 1807. «It is necessary», he wrote at the time, «to modify the assumption which I made in my last paper … and to replace red, yellow and blue with red, green and violet». Because the violet used by Young appeared to his successors to be more like blue, for reasons of simplicity red, green and blue are now associated with the «Trichromatic Theory of Vision». The first step in the perception of colours is therefore exactly how Young had imagined it at the beginning of the 19th century; the second step, however, seems to be a very different matter. Young had assumed a direct transmission of the received signals into the brain, imagining each nerve fibre that entered the brain to be composed of three parts, each responsible for transmitting one of the main colours which appear in the eye. Closer inspection reveals that the processing of colour information does not appear quite so straightforward. 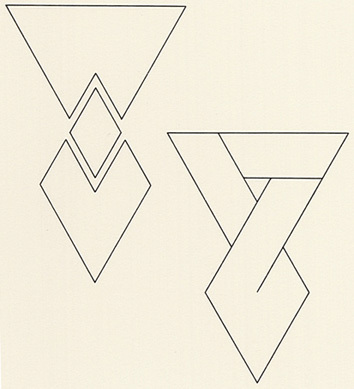 Although ideas suggested by psychologists at the end of the 19th century have also been confirmed — we will be looking more closely at this, but must adhere to the historical sequence, also with the route between the eye and the brain — the true process has only been understood to a greater or lesser degree during the last few decades. 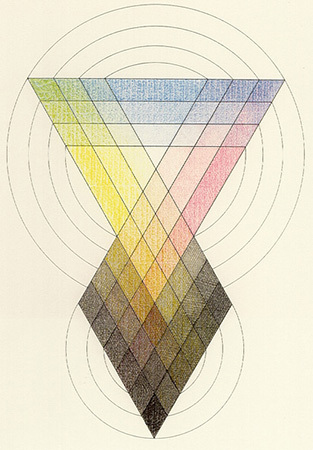 Date: Sowerby introduced his colour-system in 1809 as a tribute to the “great Sir Isaac Newton”. Bibliography: J. Sowerby, «A New Elucidation of Colours, Original, Prismatic, and Material: Showing their Concordance in Three Primitives, Yellow, Red, and Blue: and the Means of Producing, Measuring, and Mixing Them: with Some Observations on the Accuracy of Sir Isaac Newton», London 1809. «Color Documents: A presentational Theory», organised by S. Wurmfield, Hunter College Art Gallery, New York 1985; John Gage, «Colour and Culture, Practice and Meaning from Antiquity to Abstraction», Thames and Hudson, 1993, p. 221 (mention and comment).